You may have noticed a series of guest opinions over the last few weeks written by Tri-City community leaders highlighting the importance of our working river system. This letter is to add TRIDEC's voice to the chorus of messages from utility managers, the agricultural industry, tourism and conservation officials. Although these organizations have different interests, we are all united on one key issue: the importance of the four lower Snake River dams. TRIDEC's focus is on economic development for the Tri-City region, and as such it is clear to us that the dams are a vital component to the continued growth and development of our community. They provide affordable carbon-free electricity that powers our industry, irrigation that turns the desert into an agricultural oasis, and navigation that allows millions of tons of agricultural commodities and other products to be shipped on our rivers every year. All of this sounds great, but what does it really mean? The four lower Snake River Dams generate over 1,000 average megawatts of energy every year, enough to power more than 800,000 homes. The affordable and carbon-free nature of this energy is particularly important because it allows us to recruit and retain companies which provide family wage jobs to thousands of people throughout our region. TRIDEC and our partners are also very excited about leveraging the capabilities of the Pacific Northwest National Laboratory (PNNL) and local businesses to grow the Tri-Cities' presence as the ‘Energy Hub of the Pacific Northwest'. We hope to bring new jobs in energy research and development, manufacturing, and generation to the Tri-Cities in the very near future. In order for substantial new renewable energy generation to work on our electric grid, however, we simply must have the baseload power that the dams provide when the sun isn't shining, or the wind isn't blowing. Our region is also blessed with thriving agricultural, food processing and wine industries. These industries are the backbone of our region's economy and are responsible for nearly 15,000 jobs in the Tri-City area alone. Our community wouldn't have any of these industries without irrigation, and the four lower Snake River Dams provide water to over 60,000 acres of farmland in Central and Southeastern Washington. Another important benefit the dams provide is the ability to efficiently move tremendous volumes of cargo by barge rather than on our roads and railways. In 2014 alone, over 4.4 million tons of cargo passed through the Snake River Dams. 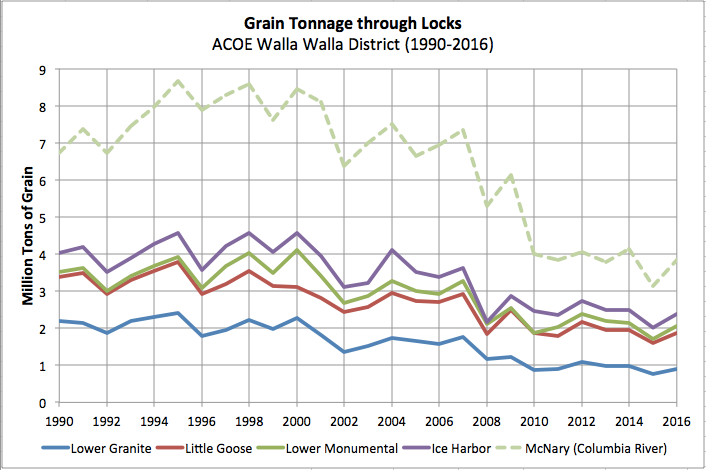 It would take nearly 175,000 trucks (over 475 per day) to move that amount of freight, and most of them would likely travel through the Tri-City area on their way to the ports. Imagine the impact to our community if we had that many additional trucks on our roads. In summary, the four lower Snake River dams represent a major investment that our country made decades ago. One that is still paying tremendous dividends today. The Tri-Cities simply wouldn't be the dynamic, economically diversified, and growing community it is without them. We hope you will join us at RiverFest on Saturday, Sept. 8th, beginning at 11 a.m. in Kennewick's Columbia Park. It will be a family-friendly event with lots of fun activities for kids, and where we can celebrate our hydropower system, our rivers, and our way of life.